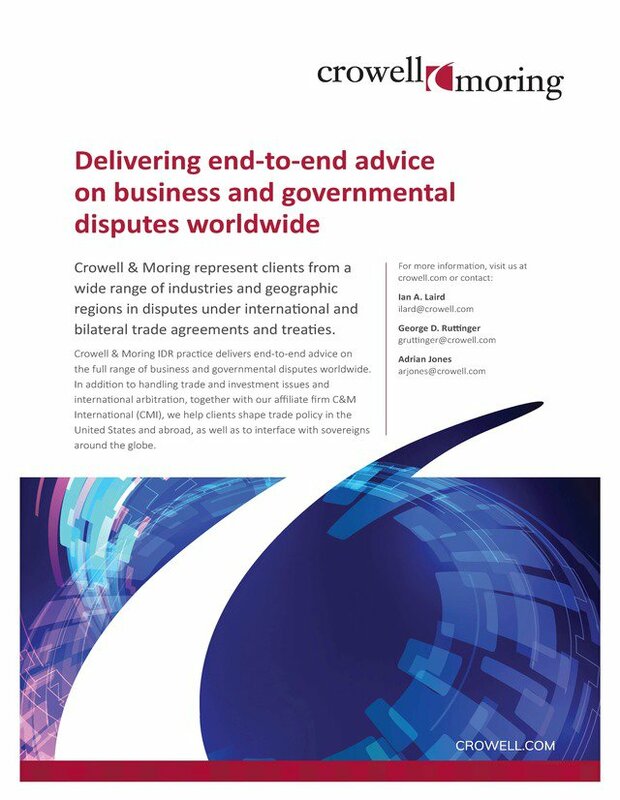 Crowell & Moring’s international arbitration practice was established in 2005 as an offshoot of its Washington, DC-based litigation practice. The group really took off in 2007 with the hire of a ready-made team from Fulbright & Jaworski, including Arif Hyder Ali, who became practice chair. It rapidly took on some weighty ICSID and commercial matters. In that year, Ali and three other partners left for Weil, Gotshal & Manges, while another moved to Jones Day. Ian Laird – a Canadian with NAFTA experience who was part of Ali’s ex-Fulbright team – and a stalwart of the firm, George Ruttinger, began co-chairing the group after that. English lawyer Adrian Jones joined as partner from Fasken Martineau in 2014 bringing experience in oil and gas, mining, and financial services disputes. Former Greenberg Traurig partner David Baron arrived in 2017 and has 20 years’ experience in investor-state work. Most of the international arbitration team is based in Washington, DC, with others in New York and London. Mining companies regularly turn to the firm for investor-state claims, including Canada’s Khan Resources and Pacific Rim. Other investors have used it in claims against Egypt, Turkey and Lithuania. Booking.com and Vistaprint have used the firm in domain disputes before the ICDR and the California-based internet regulator, ICANN. Bank of America and the US’s Duke Energy have turned to the firm for ICSID-related enforcement matters. Other big name clients are AT&T, Dana Holding Corporation and Curtiss-Wright Corporation. One of the firm’s most impressive recent results was helping Khan Resources win a US$100 million Energy Charter Treaty award against Mongolia in 2015 over the cancellation of uranium mining licences. After Khan launched enforcement proceedings in the US, Mongolia paid US$70 million in 2016 to settle the case. It persuaded the US courts to recognise an ICSID award worth US$133 million against Argentina in 2013. A year earlier, it helped the US’s Duke Energy win confirmation of an US$18 million ICSID award against Peru in the DC courts after an earlier incarnation of the Crowell practice acted in the original arbitration. Alongside former colleagues from Fasken, Adrian Jones helped South African platinum producer Impala Refining win a US$200 million LCIA award in 2015, which was enforced by a US court. The firm defended the Marriott International hotel chain from claims on behalf of the new owners. An ICC tribunal ruled that the person bringing the claim, Ziad Fakhri, did not have authority to act on behalf of the new owners. Subsequent litigation brought by Fakhri in the US and a motion to annul brought on the French courts was dismissed. A Crowell team led by Stuart Newberger secured a partial award worth US$22 million against Pakistan on behalf of Broadsheet, an asset recovery firm the state hired two decades ago to track down the assets of Pakistan’s former prime minister Nawaz Sharif. The politically sensitive dispute has been playing out against the backdrop of criminal proceedings against Sharif in Pakistan, with information from the Panama Papers data leak also playing a role in the dispute. The Damietta International Port Company instructed the firm in a billion-dollar ICC claim against an Egyptian state entity over the termination of a contract to build a port terminal. Other new work has come from a Russian businesswoman bringing an investment treaty claim against Kuwait over her prolonged imprisonment on what she says are erroneous charges. She is seeking her immediate release and US$100 million in compensation. The firm is also representing Ireland and South Africa-based aviation group Starlite in an AAA dispute over the leasing of helicopters used to support US military operations in Afghanistan. Two New York-based partners with arbitration experience, Alan Howard and Jack Thomas, left the firm in 2018. With dozens of lawyers practicing from our offices in Washington, D.C., New York, London, and Brussels, we represent clients from a wide range of industries and geographic regions in disputes under international and bilateral trade agreements and treaties. Lawyers in our IDR practice work in a diverse range of languages such as Spanish, French, German, Italian, Russian, Swedish, Hebrew, Greek and Arabic. We have handled commercial and geopolitical disputes involving business operations, transactions, projects and strategic alliances across the United States, Latin America, the Caribbean, the Middle East and North Africa, Europe and Asia. We regularly represent private parties, publicly held companies, sovereign governments and state‐owned enterprises.